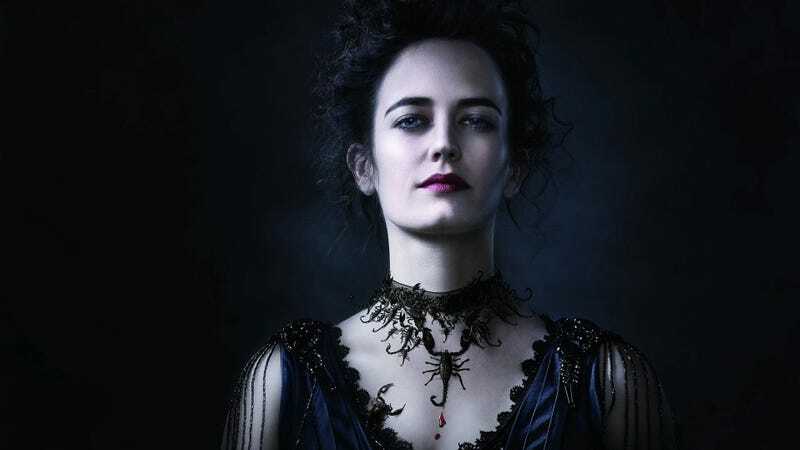 Amid all the speculation and achingly repetive talk around shows like Game of Thrones and True Detective, the Victorian gothic horror drama Penny Dreadful has been largely glossed over by the morning-after television blog churners. But it’s a good show! What could easily be dismissed as a shallow Hot Topic fever dream in the post-Twilight era is actually a surprisingly well-executed drama bolstered by a very strong cast. It’s an ensemble show, but central to the plot is Eva Green as Vanessa Ives, a witchy woman with a porcelain countenance and a nuclear core. (How many bad writers like myself have compared Eva Green to a porcelain doll? I wonder if the use of dolls on the show was partially inspired by Green’s particularly symmetrical physiognomy.) At her side is Timothy Dalton cogently growling as classic British adventurer type. There’s also Josh Hartnett as a cowboy (why not). Simon Russell Beale’s hair and beard as an Egyptologist should have their own show. And more! Patti LuPone shows up and is almost unrecognizable, obfuscated by the sheer will of her performance. The first season was a little clumsy at times in its world-building, introducing an odd collusion of characters (Dorian Gray’s presence looking like a K-pop star is difficult to justify, though he does serve as an interesting fulcrum in some side stories), the but the second season, the finale of which aired about a month ago, elevates the dark, morbid, occult aspects that were intriguing in the show’s premiere season. And for a show that’s utilizing so many characters that we’ve already seen over and over again, the strong performances and inventiveness justify revisiting the old horror classics. Penny Dreadful’s version of Frankenstein’s monster is obsessed with Romantic poetry, meekly stuttering his way through London while quoting Keats like a Victorian emo punk drama club member; when he faces his creator though, his power and rage are at the forefront. Vampires here are naked, lithe, grotesque monsters their bare skin scarred with ancient inscriptions. The recent season centers on a battle against the witches, whose form changes between normal Victorian woman and their naked “true” form, sort of like mole rats scarred with pentagrams and claw marks. Genuinely creepy and bizarre. The art direction, general design of the show, and low light cinematography are also impressive—I assume the witch’s castle in season two is carved from Styrofoam or something but it looks like a real artifact, like that Czech church adorned with thousands of human bones. Anyway, listen, if you’re not interested in a show that has a witch skeleton castle with its own basement voodoo doll emporium, then maybe this isn’t for you. Totes would Airbnb in the witch’s skeleton castle. Penny Dreadful is pretty good.